This is the list of all participating blogger and their blogs for this years meme. I have also contacted the owner of Sunday Stealing and let them in on the meme. I cannot promise that everyone on this list is participating but these are the ones who asked for the questions so that they could take part! We will see tomorrow. This is the complete list that I have compiled. If you are participating and for some reason you find your site not listed, please email me or leave a comment forthwith. I went through comments, emails and posts so this should be everybody. Please be sure to include this list at the end of your answers to the meme questions. I have decided to make the meme-like event double the fun. This year the meme will be presented twice. First on July 1st and then again on Dec. 9th. Same rules, same format, hopefully the same folks (somebody go remind Sylvia Garza about this one). She missed the last one. Everyone from last year’s meme agreed that it was lots of fun. Again our goal is the same. To have everyone who participated last year to do so again in addition to also trying to find at least one other person to play along. Just a reminder to all who were a part of the December meme. The questions for the two memes are supposed to come from you. Without your two questions there will be no meme or I will have to come up with them. How boring if I have to come up with them. If you have not already please come up with two questions (one for July and one for December) and send them to me lickety-split. The idea of the meme is to post questions that many bloggers will answer and do so on the same day and time. Then visit other bloggers, read their responses and leave meaningful comments. Many new friendships were made last year that still exist today and many new readers were gained for many bloggers. Last year Sunday Stealing found my blog and posted their answers days in advance of the day we chose. No big deal, however this year I have taken steps to prevent the premature posting of answers. Here is how the July 2012 meme will work. 1. If you want to participate, send a message to me using my contact page and in turn I will email you a copy of the meme questions. 2. You will compose your answers in a post along with the Meme graphic (not the one from above) and schedule the post for July 8th at 12.01 am EDT. 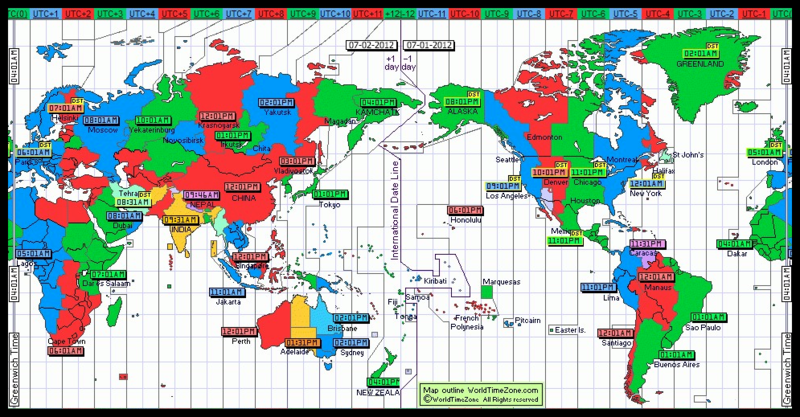 Last year everyone posted at 12.01 EST based on time zones and not on clocks. A time zone map will be provided. 3. A master list of everyone participating will be generated and posted along with your answers in this July so you will be able to pick which random blogs you would like to visit. (a) You must agree not to post your answers until everyone else does. (b) You must agree that you will visit at least five blog links that you have never visited before and leave a comment on their responses. You are also encouraged to visit them all. (c) You must answer each of the twenty questions and do so with more than a simple yes or no response. You can be as funny as you want with your responses but you cannot avoid answering the question. (d) You must post the entire Master Meme Blog List of blogs participating, regardless of how long the list may grow to be, below your answered questions. (e) You must title your post the same as everyone else, “Community Network Meme 2012”. (f) You must direct all interested parties to Morning Erection’s Contact Page to get the questions. You may not give them a copy of yours. Remember, we are trying to avoid Sunday Stealing from stealing and posting before we do. In December 2011 I shared the questions with them and they posted the meme the following Saturday for their band of merry thieves. (g) You must promote the Community Network Meme at least once on Facebook or some other form of social media, even if it is just your own blog to get more bloggers to participate. Provide the link back to this original post so they can post this in its entirety on their blogs, just like we do. (h) When bloggers visit your post on the day of the meme and leave comments you are obligated to reply to each and every one on the day of the meme and at least for one day after. If you don’t like to reply to comments after those two days, feel free not to. (i) If you would like to participate and write the post in your language and not English, feel free to translate it or you could post both translations. (j) Make sure to either vote for or like the post appropriately if the blogger is using the WordPress platform. (k) You must use the designed graphic on your meme post (the above graphic is not the official graphic for the July meme). If this is all very confusing, please check out last years posted answers. I am extremely happy to announce this years questions (both in July and December) will all be mostly contributed by last years participants. This took the stress and pressure off of one or just a few bloggers.